So here's Part II of fabulous shopping fun! Top Design Contestant/Bravo TV, Martha Stewart editor, and designer Eddie Ross led a group of design aficionados through Atlanta's Scott's Antique Market last Saturday. Southern Accents magazine also showed up to document the fun - here's hoping that story makes it into an issue soon! Jaithan, me, and Eddie are all smiles at the end of a profitable adventure - there was so much to see (and buy)! Fabrics: one of the biggest surprises (for me) at Scott's was the large quantity of beautiful fabrics in full bolts. I'm used to seeing scraps for sale here and there, but this is enough to do large pieces of furniture. Some of the finds were real shockers - including a bolt of deeply discounted Kelly Wearstler fabric!!! Talk about a steal. Isn't this beautiful? Eddie fell in love with this colorful crewelwork with touches of melon and celery shades. If you follow Eddie's blog at all, you know what a fan he is of crewel - and how good he is at making this style look fresh and new. Prints: another of my favorite finds was this booth of prints and old maps from Prints Charming Soho (recently featured in Martha Stewart Living). Framing is an obvious choice, of course, but obvious isn't Eddie! Here, he suggests blowing up this wonderful pattern and transferring it to stencils for pattern on a floor cloth, wall, or fabric. Another great idea? Decoupage - and rather than damaging a beautiful sheet from, say, the 1830s, buy a few favorites, copy them, and then decoupage those copies onto a piece of furniture or decorative box. Hang the originals nearby for a great coordinated look. There were plenty of beautiful options to chose from at Scott's! P.S. When framing small natural prints like these, blow up and copy the tiny Latin print at the bottom - and add it to the matting when framing for an art gallery look. Or, you could go completely insane and decoupage a patterned paper (or wallpaper scraps) onto an entire bureau. Eddie really liked this plaid example. It would be stunning in a gentleman's bedroom - just steer clear of bathrooms and other damp spaces unless you like the look of peeling paper. Butcher's wax is a great way to protect a decoupage surface and keep it gleaming. Glass: Eddie used to run a catering company, and as a result, he knows (and loves) his glassware. After we all pawed through piles of gorgeous silver, crystal, and plates and stood around pondering what would be "practical" to buy, Eddie made my favorite comment of the day: "Do I need this? Can I live without it? NO! You can't!" A lovely pitcher in hobnail glass. More beautiful crystal. One of the wonderful things about this booth? Each piece is priced for separate purchase. If you collect a classic pattern, you can always replace those inevitable crack-ups later with a trip to the local antique mall or flea market. As Eddie pointed out, "why have it if you don't use it?" Keep scrolling to see Part I, and more of Eddie's fabulous ideas! What a darling blog! The shopping trip looked fun too. Hey Cristin - thanks! Loved Simplified Bee - great ideas! Thanks for stopping by le' Chateau! Hope Eddie spotted some great bargains for you, he's the bees knees. Cute picture of you. 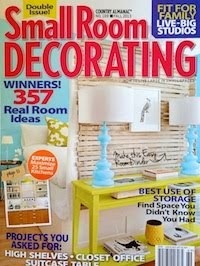 Great ideas-especially the decoupage-which is fine for a bathroom if you are talking power room. I love that plaid chest. Hey Lucinda - he is indeed! Thanks for stopping by. Beth - thanks! Isn't the chest great? Very scotch. Hey thanks for stopping by The Townhouse. I always appreciate when someone takes the time to come by and comment. You've got a great blog here and I've jumped on as a follower. If you like what you saw over my way feel free to come and back and do the same. Hi Townhouselady :) I just love your name - thanks for stopping by! Your blog is special - I'll most certainly be back. I just want to let you know how insanely jealous I am that you guys have such a great market in Atlanta!! Just point me in the direction of the milk glass booth and forget ya know me! Kristina with a K - I LOVED some of the ideas on the Purple Pea. Can't wait to put them into action. I must say, I am enjoying these posts about Scott's so much that I wish I could have been there for the fun! I am on the West Coast this month, though, so I will need to wait until Scott's comes around in July. oh, my time with eddie at the rose bowl was amazing!! i can only imagine..ive been searching for a hobail pitcher like that!!! at least i know they do exist.. Things That Inspire - I wish you'd been able to come! Would have loved to meet you. Enjoy the sunny west! Ohh I miss being so far away now!!!! All those goodies are irresistible & your haircut is so cute. Im adding it to my list of how I may chop off the long locks looks. I've accented with decoupage, furniture before: a tabletop, drawer fronts & its time consuming but so worth. Still verde in envy of your fun. Thanks for sharing more of it!!! Sweet Nothings - the rose bowl? That must have been amazing! Lucky you! Love that hobnail glass! Lucky you, shopping with Eddie (or maybe lucky him!) - looks like you had some amazing finds! Tickled Pink and Green - I know! I LOVED the chest. CONGRATULATIONS on the Southern Living gig and going with Eddie Ross!!! That's so cool... plus I loved see the pic "up close" of you - to see your face better! I took one look and thought, yep if I lived in her neighborhood, we'd be friends! And the finds you scored.... great! Another great post about a great shopping day! Enjoyed meeting you and will have my post about Scott's up today! Ah- envious!! What a great way to enjoy Scott's. Planning to go in July. Looking forward to reading more about your trip. Sounds great. And Flannery O'Connor! Whoo! Ohh, I just adore that fabric! oh i love this. it looks like soooo much fun. What a fun time and great post!!!!! I'm so jealous! It looks like you guys had a great time. you got to go! how fun. it's very nice to meet you.